This coming weekend sees sport mix with lifestyle once again as the SA Bierfest by Tops at Spar takes place at Montecasino, home of the ABSA Boktown. The Bierfest, our very own mini version of the German Oktoberfest, is an established event on the South African social calendar and in 2015 they have lined it up to coincide with the Rugby World Cup. 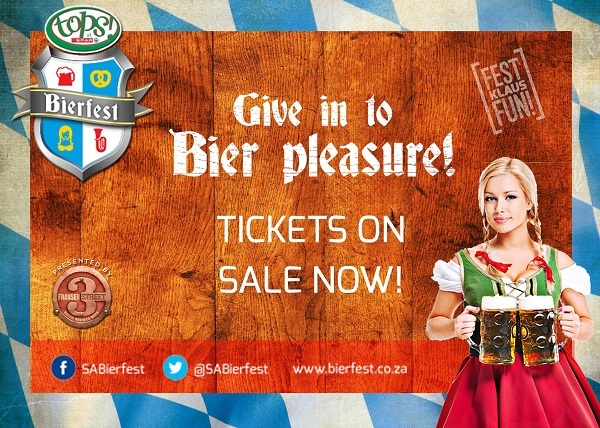 Every game that is played during the SA Bierfest will be played live on the big screen. FACEBOOK – Comment on the post sharing this article on our Facebook Page, saying you would like to win! INSTAGRAM – Comment on the SA Bierfest picture on our Instagram Page, saying you would like to win! Winners will be announced on Tuesday Afternoon via our twitter account. If you dont win tickets, make sure you buy tickets so you dont miss out on what will surely be the party of the year!! !